B14416-6032-WH is rated 4.6 out of 5 by 17. 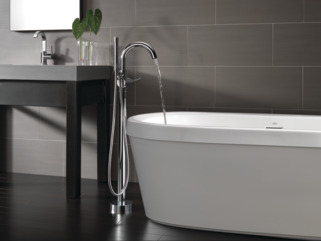 Immerse yourself in a deeply relaxing soak with the Delta Synergy Freestanding Bathtub. 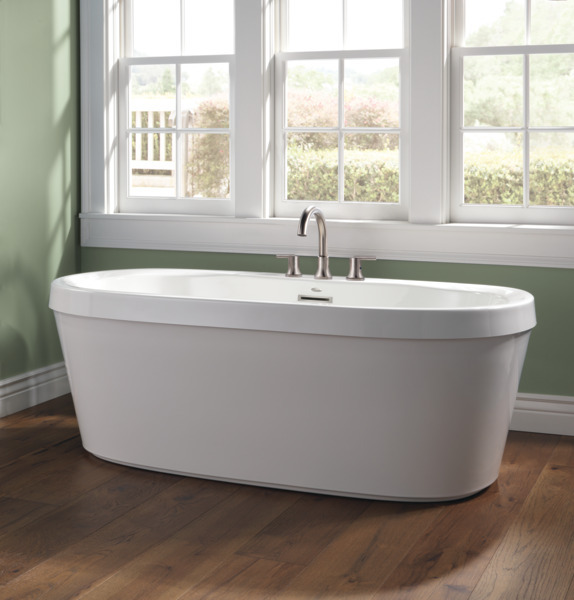 Designed with contoured sides to offer ample space and constructed from lightweight, durable acrylic material, this soaking tub helps to create a tranquil bathing experience and is easy to clean and maintain. The factory-installed integrated overflow and waste drain helps to reduce potential leak points and simplify the installation process. 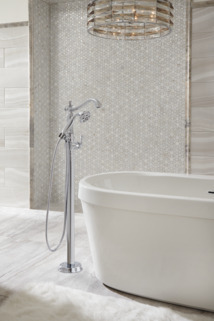 Rated 4 out of 5 by Indygurl9 from Customize your bathroom! 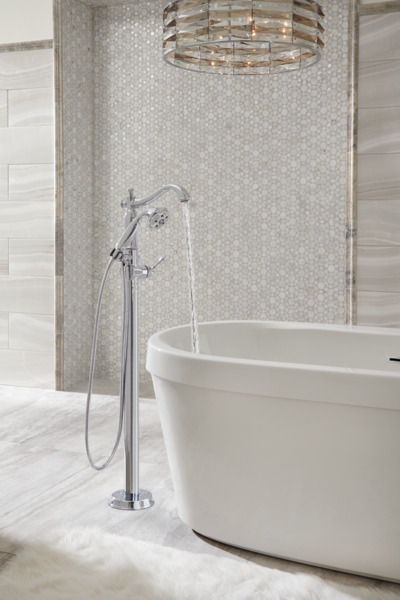 The design is great and the tub is deep. Really like the stand alone in itself. Brings a whole new way to redecorate your bathroom without having to use a built in or a portion of wall to have a tub. 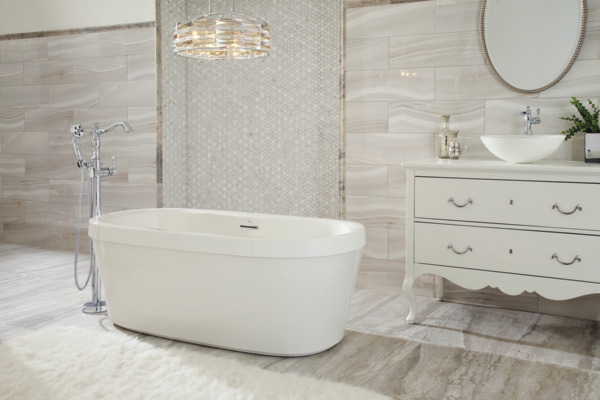 Rated 5 out of 5 by Angelc1238 from Delta Synergy Freestanding Tub This is one beautiful bathtub! Installation was a breeze with the easy to read two page directions and a few common household tools. We were able to install the tub in one day. The Delta Synergy tub is truly a beautiful addition for anyone who is looking for a sleek and modern soaker tub (about 26" deep) when updating their bathroom. 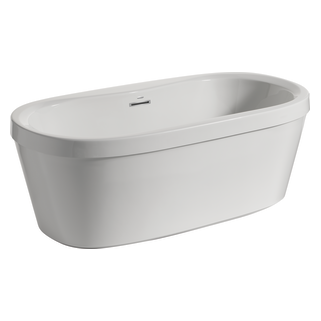 The tub is free standing and has clean lines in a high gloss white color, with the drain hole in the center of the tub. We had really had our hearts set on using a floor mount faucet to complete the modern look but due to space issues we went with a faucet that mounts to the deck of the tub. It is still very clean looking as it sits on the center edge of the tub. Rated 5 out of 5 by Sandre813 from Easy and enjoyable This tub is absolutely fantastic! It's well constructed, and with the integrated overflow & waste it's super easy to install. You literally run a line of caulk around the bottom, and set it in place. For installation, you will need caulk and a faucet. 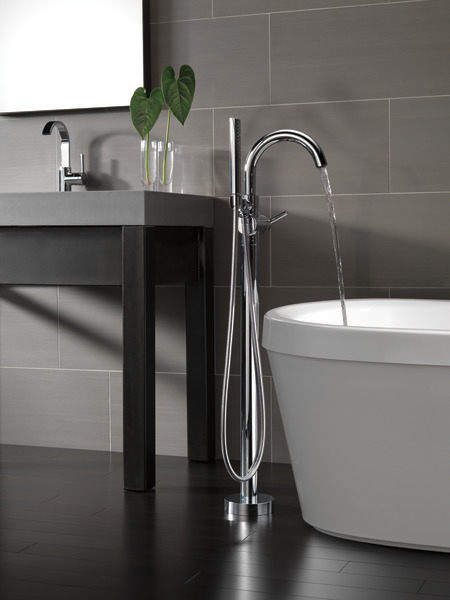 You can use a deck faucet, or freestanding faucet! 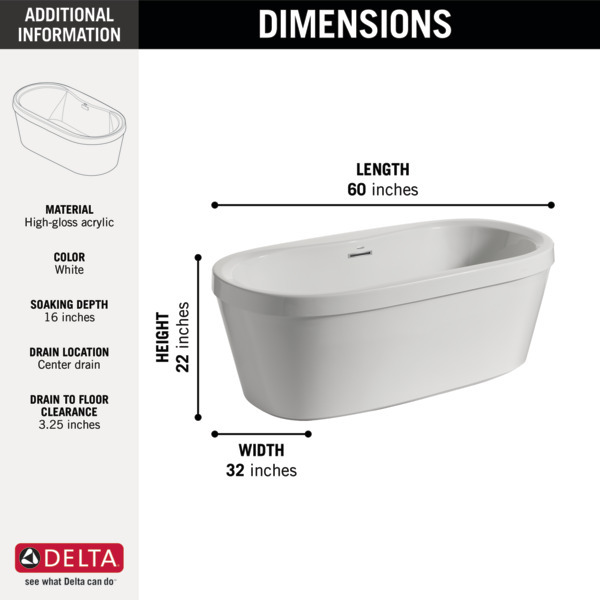 This tub is much deeper than it looks--- I'm 5'11, and until now had not been able to find a tub that is super comfortable to soak in. Delta has won me over with this tub though... This bath tub is the perfect length and depth for me to soak comfortably, without having to origami myself into a position suitable for my feet and shoulders to soak simultaneously! Plus, the water stays hot long enough to enjoy and relax. 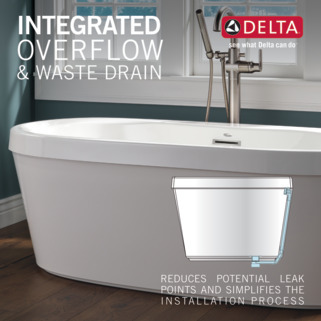 The Delta Synergy Freestanding Tub with Integrated Waste and Overflow made my bathroom renovation easy and enjoyable. I received a free sample to test and review, and I can honestly say that I would highly recommend this tub! Rated 5 out of 5 by JGraham6 from Not just a place to wash, Love the tub! I really like how deep it is and comfortable it is to sit in. I find it very relaxing. It also cleans up very nice. Rated 5 out of 5 by mcdiverest8 from Love this tub! I was able to try the Synergy Freestanding Tub in exchange for my honest review. Installation on this tub was extremely easy and it's so lightweight which is great for do-it-yourselfers like myself. The tub itself is stylish and timeless and the perfect fit for my bathroom! I have plenty of room when I take a bath and it's very comfortable. I would highly recommend this tub to anyone who is interested in a freestanding tub - great style and quality. 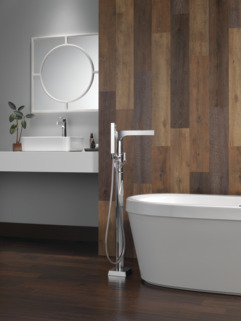 It has helped upgrade my bathroom and I love taking baths it in! Rated 5 out of 5 by shelby674 from The best tub This tub is wonderful I love that you can fill it deeper then most tubs. 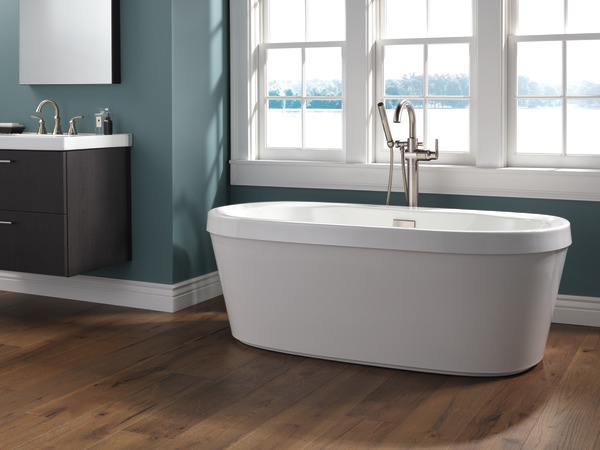 It is the best tub for a very relaxing soak. 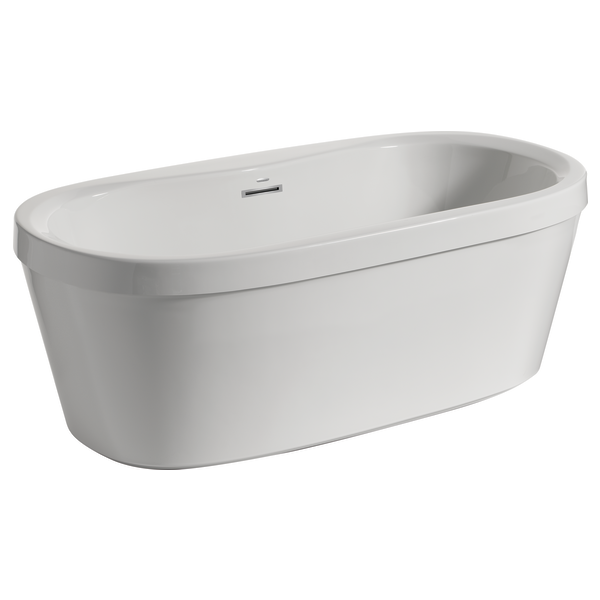 The only thing that could be different is the length other wise it is a great tub. Because it is two pieces , would you consider this insulated? Do you have 2D or 3D drawings for the Synergy bathtubs? Which faucets are installed in the marketing photos above? 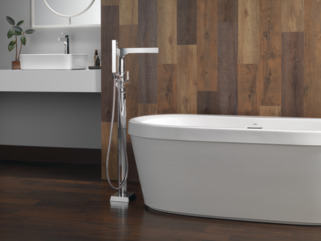 Where is this tub manufactured? What is the angle of lumbar support in this tub? I don't see any photos of the exterior back of the tub. Where I want to install the tub, all of the exterior sides will be seen. Is there an access panel on the exterior below the mounting deck/overflow? Or is it smooth like the exterior front side? Is there a kit to secure this to the floor? Which Delta faucets do you recommend as deck mounts for this tub?